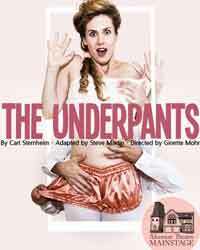 Alumnae Theatre opened its 2013/2014 season with The Underpants, a sweet frothy delight. It was written in 1910 by Carl Sternheim. It was called Die Hose and is a farce poking fun at bourgeois snobbery. This adaptation by Steve Martin was first produced in 2002. Interesting that the play’s themes are still relevant today, feminism, gender roles, conformity vs individuality; they aren’t as controversial as they were 100 years ago but we still struggle with them. I have to admit that I didn’t spend a lot of time worrying about the themes. Most of the time I was laughing. So was my friend Glenna. We both loved the physical comedy, it was really well done. In true farce fashion there were people in and out of rooms, plotting and scheming, trying to avoid each other. The actors all overacted when it was right to overact a tough balance to achieve and a credit to Ginette Mohr’s direction. The cast – Andrew Anthony as Theo Maske, Carolyn Hall as Louise Maske, Chantale Groulx as Gertrude Deuter, Scott Farkey as Frank Versati and the King, Michael Gordin Shore as Benjamin Cohen and Jacqueline Costa as Klinglehoff – were excellent; a lot of talent and perfect timing on stage tonight. It is an excellent production and makes for a fun and funny evening. We both enjoyed it. And, to everyone at Alumnae Theatre, Nice Washrooms!